St. Cecilia's Catholic Church on 17th Avenue has taken to posting some secular, pro-Giants messages on their street-facing sign now that the Giants are two games up in their third playoff bid in five years  and did anyone watch all of that endless game on Saturday? Jesus. The most recent message from St. Cecilia's, tweeted out by the Giants themselves, says, "Sunsets are orange and black. Yes! God is a Giants fan." As CBS 5 notes, via Twitterer Caleb Whang, the church had a message up back in August that said, "Thou shalt not steal... unless you are a Giant on first base." 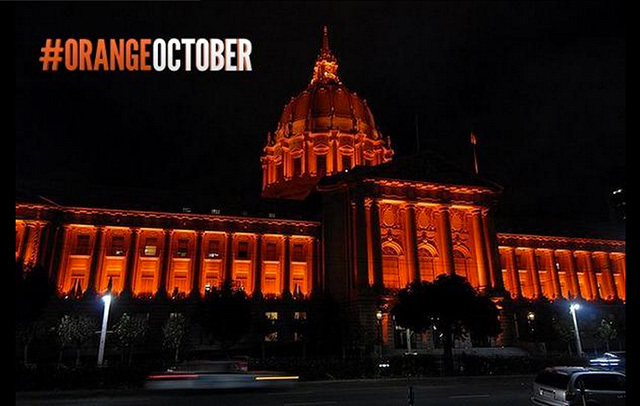 In related news, City Hall is orange. Today's Game 3, at home in San Francisco, starts at 2:07 p.m.